In order to help ensure business are listed and presented correctly, Google designed a platform called Google My Business. This free platform is a hub for your plumbing company’s pertinent information like location, contact information, and services. Google My Business also helps Google easily index your plumbing services and business information so you rank better in Google search results. The Top Section Offers Important Details Like Location, Phone, and Services. The Lower Portion Provides Reviews, Links to Your Posts, and More. Google My Business is a great tool for your plumbing company that helps you to optimize better online. In fact, the information you input in Google My Business can help you in more ways than one! This platform is easy to use and allows you to tell Google exactly what it needs to know about your business. It is designed to help you manage your business info and connect with your clients and potential clients. 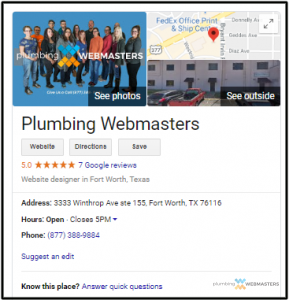 With Plumbing Webmasters, you have access to a team of experts that will help you design your ideal plumbing company Google My Business strategy. Google My Business is a great tool to help with tracking your plumbing site’s page views, getting insights on things product and services clients like, and interacting with customers who leave reviews. When you want you local plumbing company to optimize organically online, there are many steps you need to take. With the help of a professional SEO team, such as the Plumbing Webmasters, you don’t need to do this alone. 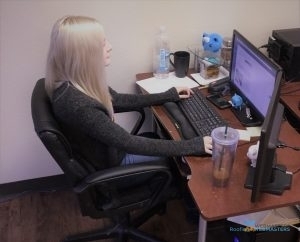 However, we know how important your business is to you, and we give our clients the tools they need to be involved in the plumbing SEO process as much or as little as they care to be. 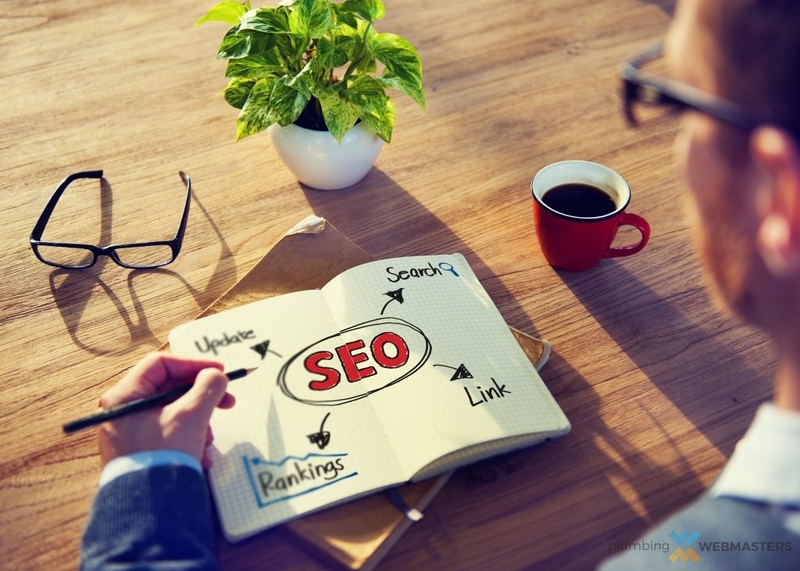 To begin, remember that SEO for local businesses can be very different than typical SEO and that marketing for your local business will vary greatly from how others online may market for digital products. With that in mind, be mindful when researching on your own, and taking advice from non-local business owners. When it comes to local searches, Google My Business is an incredibly effective tool for optimizing in your area. However, part of what keeps Google services so impressive is how often they can change and adapt. If you want to continue to optimize as a Google My Business local plumber, you need to make sure your company is diligent about keeping up with these changes. You will need to verify your business with Google when setting up your account, and it can take a couple of weeks to go through. In order to keep things running smoothly, take care to make certain that all of your information is correct. This includes the category you have listed your business under is the best for your business. If you are uncertain of the ideal listing for your plumbing company, give us a call and we can help you decide. Your Plumbing Company’s Google My Business Account is a Crucial SEO planning Component. Next, make sure your address is not only correct but also consistent. Google can be very specific on these things, so all of your addresses, from all of your social accounts to your website, need to be written the same exact way. Confirm that your store hours are correctly listed on your Google My Business account. This helps your account and your clients. Additionally, if your incorrect listing happens to inconvenience a potential client, you may end up with a bad review! Another thing that will help optimize your Google My Business listing is a thoughtful introduction. Include a few words about your company values, and be sure to stylize your introduction correctly, with headers, bullets, and keywords! Go on to add a few photos to your listing, including a photo of yourself or your employees. This helps your clients and potential clients connect with your business better, and can aid in building trust. As discussed in our Plumber Reputation Management section, you should always ask for reviews from your clients. 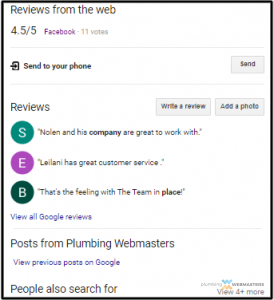 Reviews on your Google My Business for plumbers listing will help with your optimization, customer satisfaction, and potential client conversion rates. Additionally, don’t forget to respond to the reviews you have already been given. Include a thank you for the review and an invitation to return! This helps you connect with customers and lay the groundwork for customer loyalty. Our Experts Work Hard to Ensure Your Google My Business Profile is Complete and Accurate. At the Plumbing Webmasters, we are dedicated to helping our clients succeed in every corner of your web presences. From social media accounts to your main plumbing company website, to great tools like Google My business for plumbers, we can help you increase your visibility through online optimization. Online optimization is a comprehensive effort, that requires work applied to many different areas. With SEO experts on your side, you will see long term results that will positively affect your sales and client base. Call us today at (877) 388-9884 to get started! Updated on April 3, 2019 at 7:19 pm by Plumbing Webmasters.